Events in Fabian’s life led him to embark on what he now feels is his purpose in life: helping everyone affected with cancer. Following business studies at Stockholm School of Economics in 2011, Fabian went on to pursue a career in investment banking in London. After two years of working as a bonds trader, Fabian resigned to follow his passion to work in the film industry. In 2015, Fabian was diagnosed with cancer and his life took a completely different turn. Sweden recognized his work and impact–Fabian won the award “Journalist of the Year 2015” for his blog by CancerRehabFonden and was selected as a Swedish Super Talent 2018 by Veckans Affärer. Recently he was ranked No. 1 on the list of most influential in the Swedish MedTech industry 2018. “I wrote the first post on social media because I wanted to get in touch with someone with experience from leukemia. I had so many questions that the healthcare couldn’t provide answers to. Questions surrounding life with cancer, career, diet and exercise. When I asked the healthcare about diet advice, they told me to “eat whatever made me happy”. So I turned to social media to get my answers. The post was shared 13,000 times and what followed was the most beautiful thing I’ve ever experienced. Thousands and thousands of people from literally all over the world got back to me with messages of love and support, and what I also noticed was that there was a lot of gratefulness in those messages. Many started out saying “Thank you for sharing this, I am going through the same thing as you are, and just so you know – this is helping a lot of people.”, Fabian explains. Fabian’s post resulted in over 100.000 messages, emails and letters of support received. He says that the instant gratification he felt from helping others made him happy. 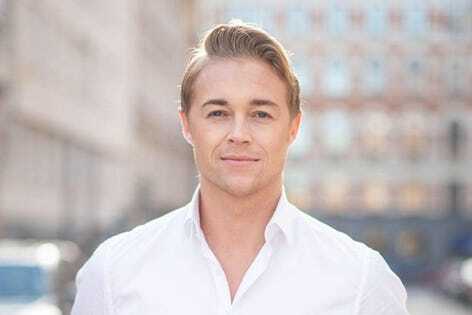 Hence, he made the decision to share his entire journey in a blog named ’Fabian Bolin’s War on Cancer’. WarOnCancer is a tech company on a mission to improve mental health for everyone affected by cancer. The company is currently developing a social network for patients, survivors and loved ones–a niche community for cancer focused on storytelling–through which it also aims to become a global provider of patient-reported data to the healthcare and biopharmaceutical industry. Their vision–“A world where people affected by cancer are seen as humans–and treated that way”. “We have partnerships with six leading pharmaceutical companies within oncology and immune-oncology. We are currently beta-testing the app together with members from two earlier versions of the platform. We also recently launched Search by WarOnCancer – our very own search engine that donates to cancer research. Just like other search engines, ads will appear with your search results, whenever you click on one of the ads money will be donated to cancer research. We are using simple everyday technology to modernize the way people can make an impact.”, tells Fabian. Up to date, they have over 2500 users on the mobile app. Majority of the users come from Sweden (42%). The development team is from Bosnia and Herzegovina so the 34% share of users is a bit biased due to the test accounts. However, the app also has users from Slovenia, USA, UK, Ireland, Norway, Denmark, Italy, Netherlands and other countries. Next time you face a problem or difficulty in your life remember Fabian Bolin’s enthusiasm, and how he succeeded to turn a devastating situation into something amazing that helped and inspired millions.